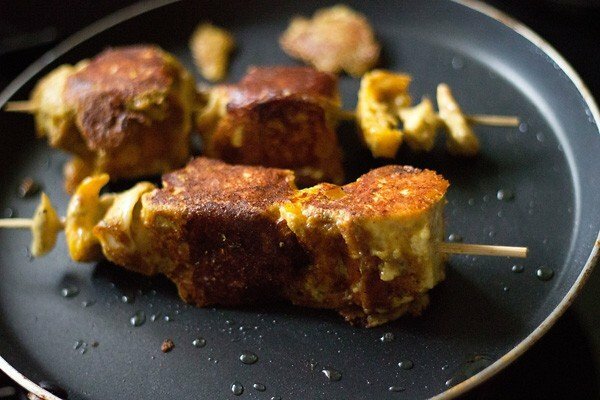 grilled cottage cheese cubes flavored with pickling spices. 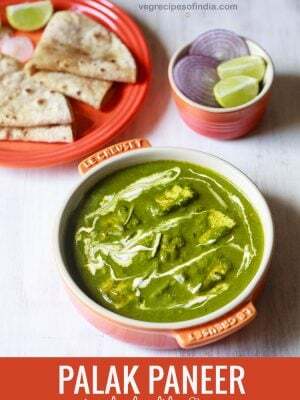 achari paneer tikka recipe with step by step photos – yet another variation of the popular paneer tikka flavored with pickling spices. 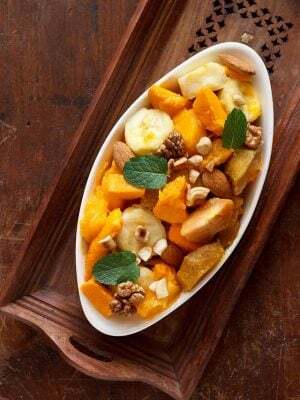 if you enjoy biting into pickle and relishing the sour taste of lemon or mango then you will like this recipe. 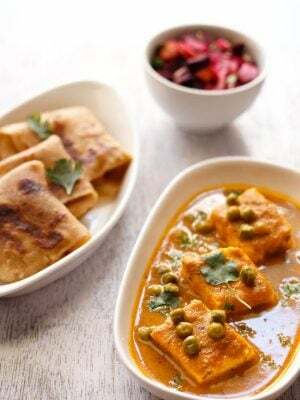 you can also check paneer tikka and achari paneer recipe. achar or pickle is a condiment which often accompanies indian food. the spices which are used to make the achar masala is more or less the same everywhere in india. mustard (sarson), fenugreek (methi seeds), red chili, turmeric and asafoetida are the common spices used in many pickles. these spices flavor this achari paneer tikka recipe too. i have also added fennel seeds (saunf), nigella seeds (kalonji) and mustard oil. you can skip kalonji if you don’t get them. any other oil can also be added instead of mustard oil. 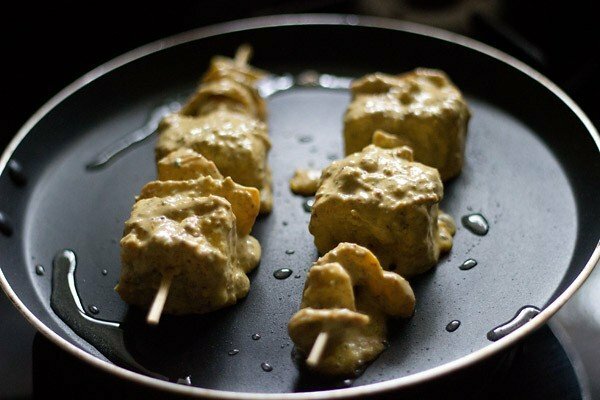 since i get a lot of queries for making tikka on stove top, in this post i have mentioned both stove top and oven method for cooking the paneer tikka. you can also grill the tikka in an electric grill or barbecue grill. even a tandoor will work. first take all the spices namely - mustard seeds (i used split mustard seeds), fenugreek seeds, fennel seeds, nigella seeds and dry red chilies in a dry grinder or coffee grinder. grind all these spices to a fine powder. a slight semi fine texture is also ok. this is the dry achari masala. keep aside. 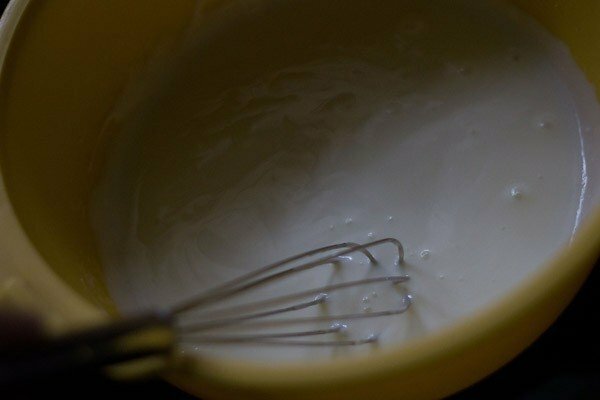 in a bowl take hung yogurt or thick yogurt and whisk till smooth. to make hung yogurt, place the yogurt in a muslin cloth or a cotton napkin. tie tightly and place on a strainer, which is kept over a bowl. keep in the fridge till all the whey gets collected in the bowl. this takes about 4 to 5 hours. you can also keep overnight. here i used thick yogurt. 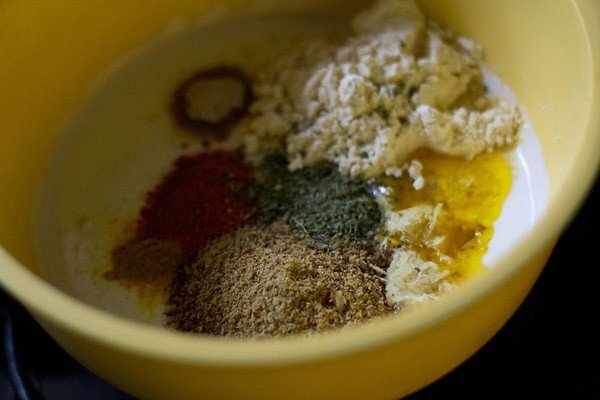 add the powdered achari masala, red chili powder, gram flour/corn starch, ginger-garlic paste, asafoetida, coriander powder, red chili powder, dry mango powder or lime juice, crushed dry fenugreek leaves (kasuri methi), salt and mustard oil. you can also use ready made achar masala or pickle masala. add about 2 tbsp of dry achar masala in the marinade. mix everything into the beaten curd. check the taste and add more salt or other seasoning if required. add the bell peppers, onions and paneer cubes. 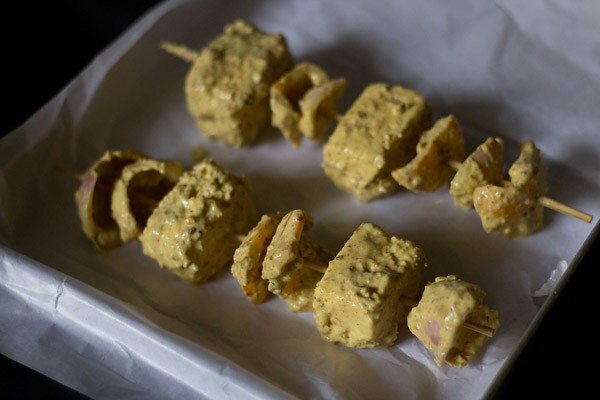 gently mix the paneer cubes and veggies till they are evenly coated with the achari marinade. cover and refrigerate for about 1 hour or overnight. you can also keep for any number of hours. once you remove from the the marinated cottage cheese cubes and veggies from the fridge, then gently mix again. preheat your oven to 200 degrees celsius/390 degrees fahrenheit for at least 10 minutes before you grill the tikkas. for a regular oven, keep both the top and bottom elements on and keep the pan in the center or top rack. for a microwave oven use the convection mode and preheat at 180 degrees celsius/350 degrees fahrenheit. 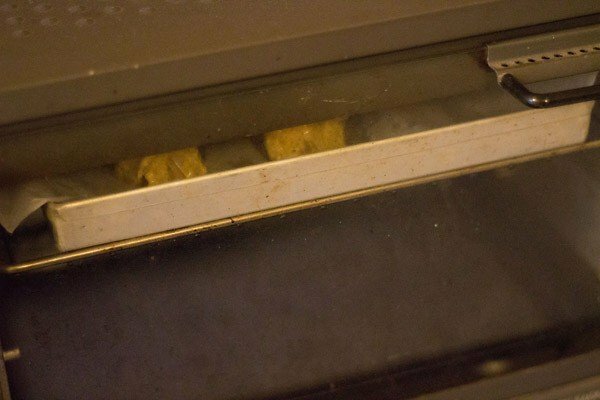 cover a baking tray with an aluminium foil. 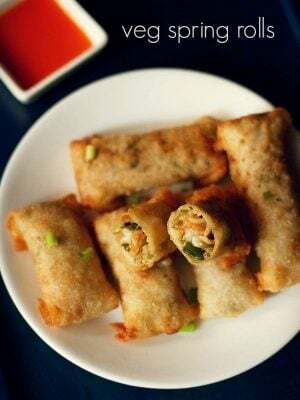 avoid butter paper like i have done as the paneer sticks to the butter paper once grilled. 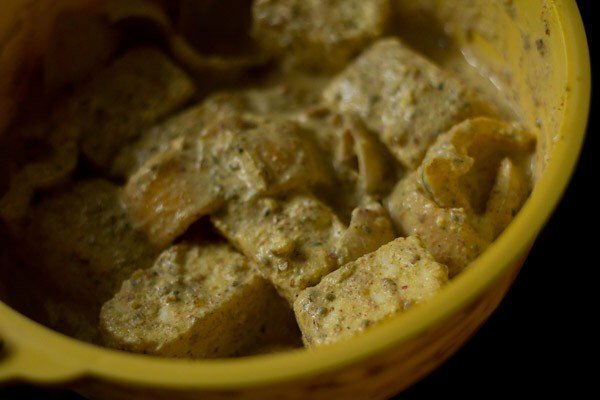 brush the marinated paneer with 1/2 to 1 tsp of mustard oil or any other oil. place the tray in a the top rack or middle rack of a preheated oven. keep both the top and bottom heating elements on. grill at 200 degrees celsius for 15-25 minutes (depending on the oven temperatures). i have a slow oven, so it took 25 mins for the paneer cubes to be grilled and browned at the edges. just keep an eye when the paneer is getting grilled in the oven. for a microwave oven in the convection mode, use 180 degrees celsius/350 degrees fahrenheit for grilling the tikka. heat about 2 to 3 tsp oil in a non stick pan. 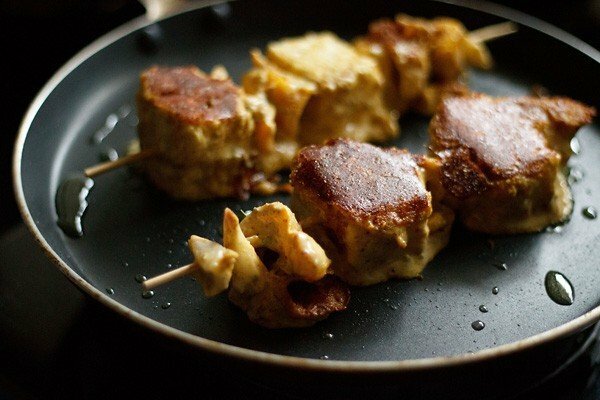 place the threaded paneer tikka with the skewers on the pan. you can also fry the marinated paneer cubes and veggies without the skewers. gently rotate the skewers, when one side is crisp and browned. keep on rotating till all the sides are browned. add more oil if required, while frying. fry till all the sides are golden. pan fry on a low flame as the marinade gets browned quickly. keep the fried paneer tikka aside. 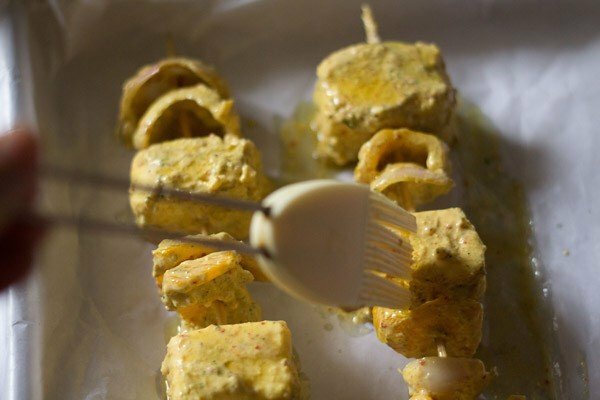 serve achari paneer tikka with onion slices, lemon wedges and mint yogurt chutney. sprinkle chaat masala and lemon juice on the achari paneer tikka while serving. you can also garnish paneer tikka with chopped coriander or mint leaves. 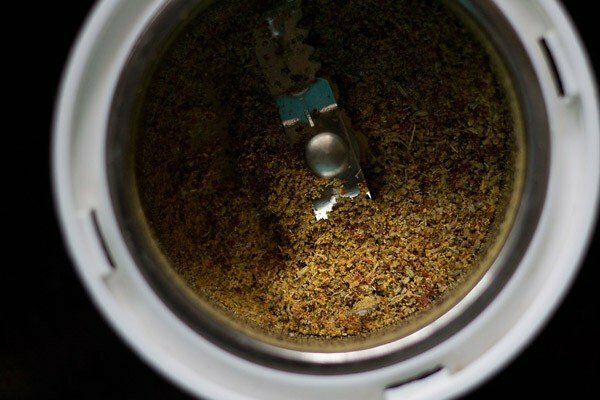 1. first take all the spices namely – mustard seeds (i used split mustard seeds also called as rai ka kuria), fenugreek seeds, fennel seeds, nigella seeds and dry red chilies in a dry grinder or coffee grinder. 2. grind all these spices to a fine powder. a slight semi fine texture is also ok. this is the dry achari masala. 3. in a bowl take hung yogurt or thick yogurt and whisk till smooth. to make hung yogurt, place about 1 cup curd/yogurt in a muslin cloth or a cotton napkin. tie tightly and place on a strainer, which is kept over a bowl. keep in the fridge till all the whey gets collected in the bowl. here i used thick yogurt. 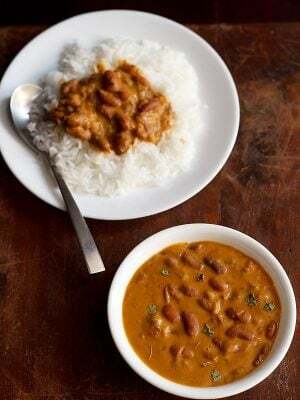 4. add the powdered achari masala, red chili powder, gram flour/corn starch, ginger-garlic paste, asafoetida, red chili powder, dry mango powder or lime juice, crushed dry fenugreek leaves (kasuri methi), salt and mustard oil. 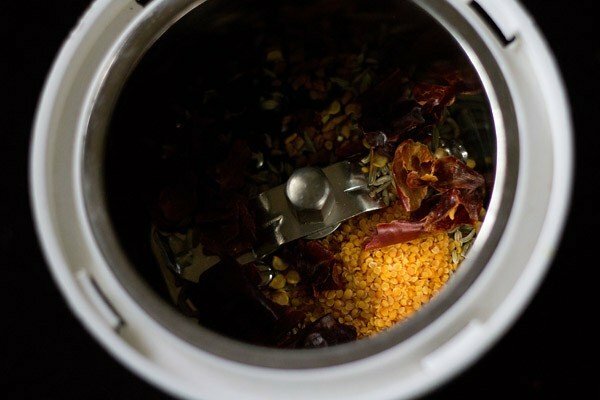 you can also use ready made achar masala or pickle masala instead of grinding the spices. add about 2 tbsp of dry achar masala in the marinade. 5. mix everything into the beaten curd. check the taste and add more salt or other seasoning if required. 6. add the bell peppers, onions and paneer cubes. 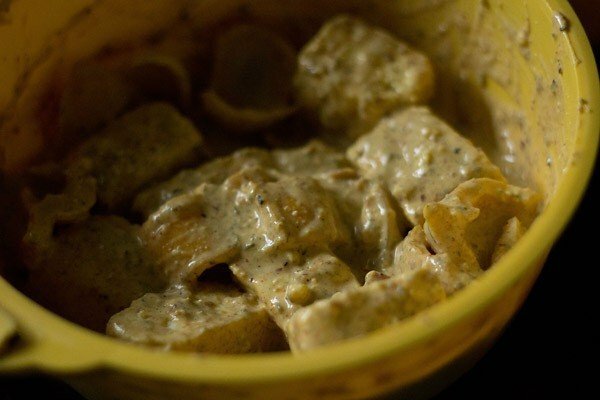 7. gently mix the paneer cubes and veggies till they are evenly coated with the achari marinade. cover and refrigerate for about 1 hour or overnight. you can also keep for any number of hours. i kept overnight. 8. the marinated cottage cheese cubes and veggies the next day. gently mix again. 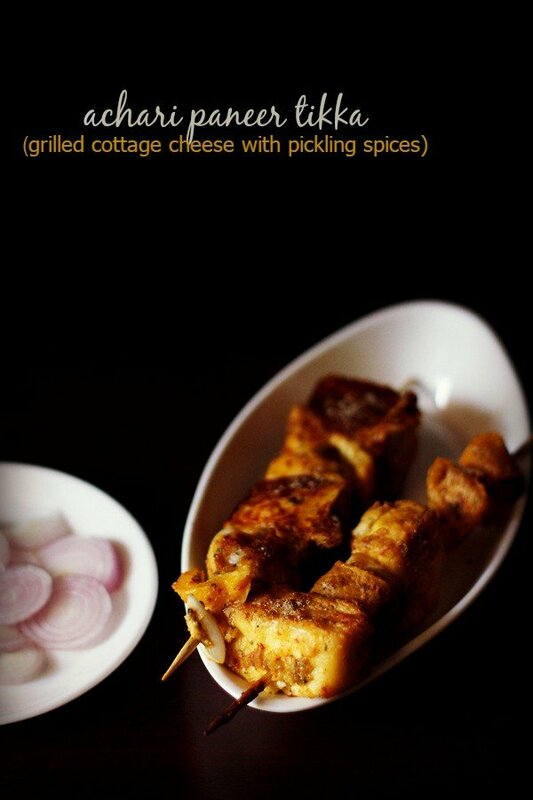 9. thread the veggies and paneer cubes on a bamboo skewer or metal skewer. you can also use toothpicks. preheat your regular oven to 200 degrees celsius/390 degrees fahrenheit, for atleast 10 minutes before you grill the tikkas. for a regular oven, heat both the top and bottom elements and keep the pan in the center or top rack. for a microwave oven use the convection mode and preheat at 180 degrees celsius/350 degrees fahrenheit. cover a baking tray with an aluminium foil. avoid butter paper like i have done as the paneer sticks to the butter paper, when grilled. i did not have aluminum foil and hence used butter paper. 10. brush the marinated paneer with 1/2 to 1 tsp of mustard oil or any other oil. 11. place the tray in a the top rack or middle rack of a preheated oven. keep both the top and bottom heating elements on. grill at 200 degrees celsius for 15-25 minutes (depending on the oven temperatures). i have a slow oven, so it took 25 mins for the paneer cubes to be grilled and browned at the edges. just keep an eye when the paneer is getting grilled in the oven. for a microwave oven in the convection mode, use 180 degrees celsius for grilling the achari paneer tikka. 12. heat about 2 to 3 tsp oil in a non stick pan. place the threaded paneer tikka with the skewers on the pan. you can also fry the marinated paneer cubes and veggies without the skewers. 13. gently rotate the skewers, when one side is crisp and browned. keep on rotating till all the sides are browned. add more oil if required, while frying. 14. fry till all the sides are golden. pan fry on a low flame as the marinade gets browned quickly. keep the fried paneer tikka aside. 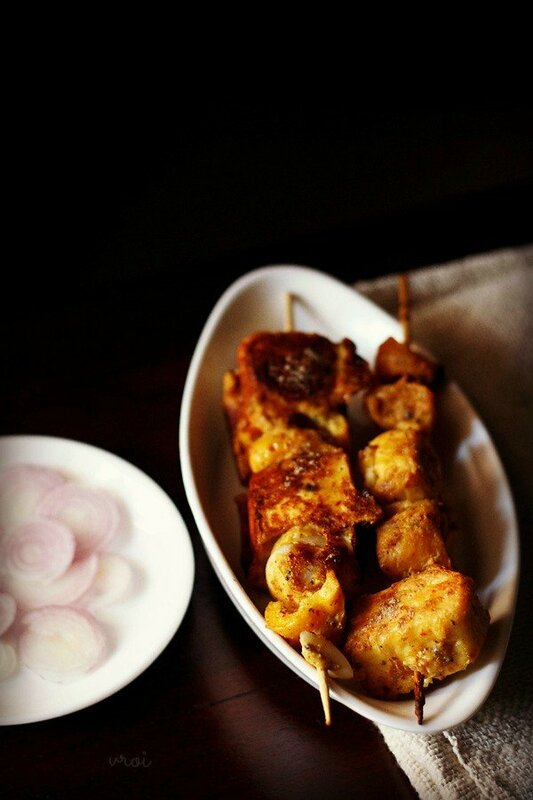 15. serve achari paneer tikka with onion slices, lemon wedges and mint chutney. sprinkle chaat masala and lemon juice on the achari paneer tikka while serving. you can also garnish paneer tikka with chopped coriander or mint leaves. 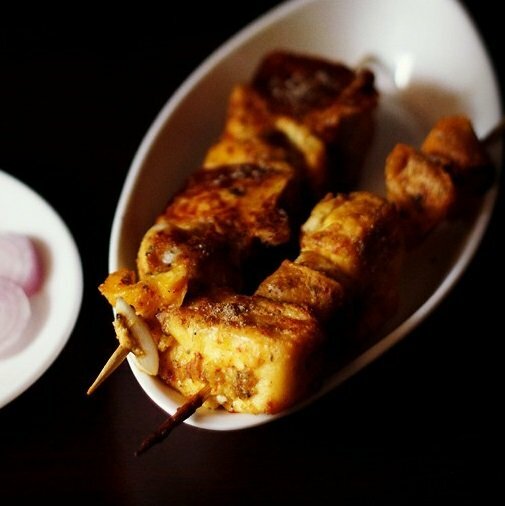 the paneer tikka on the left side is pan fried and the one on the right side is grilled. 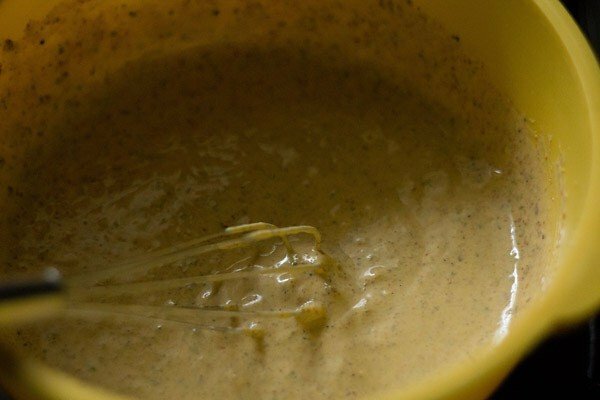 increase the amount of besan, than what is mentioned in the recipe. you can also add corn starch. I absolutely love your recipes and your healthy approach to food. Some days back I saw some recipes on this blog from other people which took me to their websites, it had diabetic friendly recipes. Somehow, I’m not able to locate it now. Please help. Thanks for the receipe. The taste is amazing and my guest loved this. I hope to pick up few more receipes from here. welcome bharathi. yes do try some more recipes. Wow…. it looks Yummm. I am going to try this weekend. Thank you so much. add paneer directly to the marinade mixture. no need to fry. 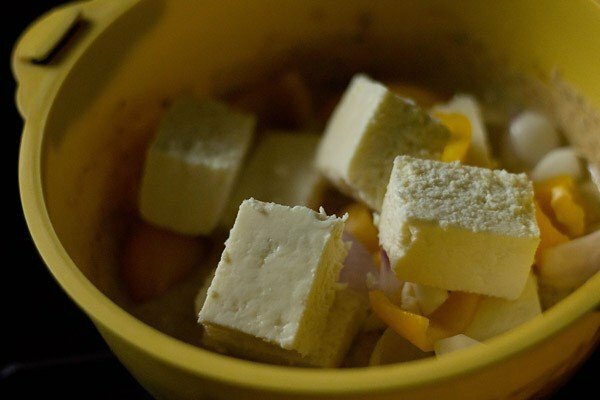 as we will be frying or grilling the paneer cubes later. thanks priyanka. discovered your website while googling for a recipe sometime back. Ever since loving your website. Your website inspires me to cook things that I have never ventured into in my 12 years of cooking journey. Being a south Indian it was difficult for me to get a perfect north Indian taste in the north Indian dishes I would occasionally prepare. But now with the help of your website I feeling I am slowing getting in there. I have tried making roti, Punjabi samosa,rajma,mixed veg korma and kheer from your website in the past few days everything came out perfect and my family was happy to eat them. So now your website became like a go to stop for me everyday. Thank you for all the wonderful recipes pictures and inspiring write-ups. I request you to please post north Indian style mixed vegetable achaar recipe for me.I live in a place where sunshine is a luxury at this time of the year and I hate those vinegar dominated store bought north indian pickles.so please post a easy to make quick no /less vinegar northindian style mixed veg pickle please…..
feeling good to read your comment, madhavi. my pleasure 🙂 the mixed achar recipe that we make in the winters – gobi, shalgam and gajar achar also has vinegar 🙂 but they taste good and the vinegar does not dominate the pickle flavors, but yes its presence is felt. i have not yet posted the recipe. still waiting for some fresh winter red carrots and shalgam to appear in the market. i hope i am able to post this achaar recipe this time. for last two years, i have not been able too make this pickle in the winters. I have tried making tikkas before but my paneer became hard and dry when I removed it from the oven. Do you know why that could have happened? I did not use skewers because I’ve heard they can catch fire in the oven. So I’m scared of that. after a long time preeti. hope you had a great diwali. smiling at your first sentence. till date the skewers i used, have not caught fire 🙂 i have read that dipping the skewers in a glass or mug of water for a few hours, makes them safe and they do not catch fire. paneer became hard due to over baking. it also depends on the quality of paneer. Oh that immersing skewers in water thing makes total sense. I will have to try that now. I had a great Diwali but was having tons of guests at home so didn’t check the blog. But now I’m back 🙂 Hope you had fun too! we had a nice diwali. relatives and guests were here before diwali. even we were busy and hence infrequent posting on the blog. looks so yummy….thanks for sharing. Really love your work. Keep up the good work. welcome rujuta. thanks for your positive words. Thanks for sharing your recipes. Really love your work. Keep up the good work. This looks amazing ! I just wanted to know like which camera u use for taking pics as i wanna buy a really good one for blogging too ! Great pics you click! thanks tapaswini. i am sorry, i could not reply to your previous comment. we get a lot of comments and your comment would have been answered today. i use canon 600 D. i suggest buy the camera without the lens. as it will be cheaper and better. buy the camera lens separately. the lens which comes with the kit is not good. you can check in google which lens are good for food photography. 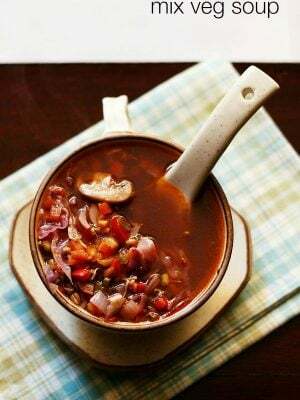 Wondeful recipe as always! 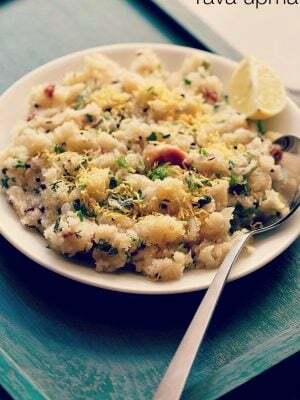 Can you please post the recipe of Aloo Achari sometime? That’d be great. welcome minnie. i have noted down this recipe name in requested recipe list. I don’t eat cow dairies but I would totally try this recipes with tofu and soy yogurt instead 😀 Seems sooooooo yummy! you can easily try this recipe with tofu and a vegan yogurt. i would not suggest soy yogurt, as it gives the typical soy flavor and taste. almond yogurt or cashew yogurt is a better substitute.